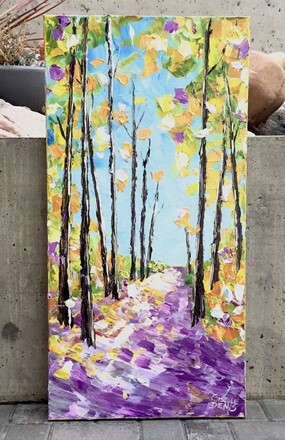 When I was painting this piece someone said to me, "There isn't purple in the forest." I said, "There is lots of colour in the forest & I want to help you see how much colour there is!" He leaned back, smiled & said, "Yeah! I like that! I love the purple!" Sometimes it's nice to be reminded to look at things from a different angle. If you look out the window & all you see are the leaves falling & are dreading winter, you will miss the beautiful things that happen to the colours of nature preparing for the next season. If we expect the usual & the common, that is how we will experience life. But if you expect the unexpected, you have a much better chance of experiencing life in a different, unique & interesting way. Life is much more enjoyable when you expect the unexpected.